Favorite Quote: "Pray like it all depends on God, then when you are done, go work like it all depends on you"
Joe Grace was born in the Youngstown area and began playing organ at the age of 9. With an Italian father and Polish mother, he can rattle off Tarantella and Beer Barrel Polka without blinking. In the school band, he began playing his mother's clarinet, but soon switched to sax in order to play in the jazz band. Continuing to play in high school and college bands, Grace has never been without music. 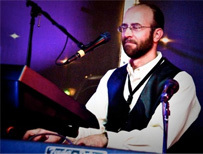 Playing for hundreds of weddings and every Sunday in a church worship band, music is his primary means of expression. As a left-brained engineer, some (like his wife) may say it's his only means of expression. Grace has passed on his love for saxophone to his two daughters, both of whom played it during their school days. Aside from music, he enjoys gardening, computers, home improvement, and cooking. As the most recent addition to VERVE DADDY, he was introduced to the band by Kevin Armbruster, his compliment in Verve Daddy horns. With a wide taste in music (jazz, rock, country, classical and big band), Grace adds to the variety that is Verve Daddy.